The JAMMER® is a belt harness with resistance bands that extend from the waist to a player’s wrist. It is the most effective training device to “over train” the punch in pass protection. 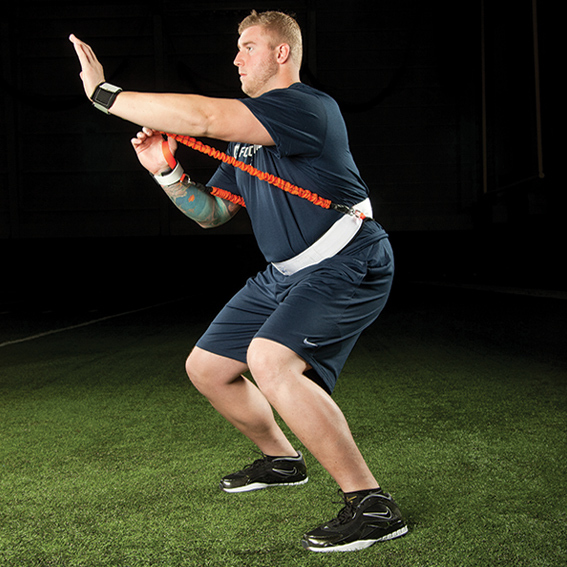 The resistance band forces a blocker to keep his hands up and to “strain” through every punch. When the Jammer® is removed, a blocker immediately feels quicker and more explosive with his hands and his punch! A great tool for O-linemen, Tight Ends, and Running Backs in pass pro drills. Use it versus partners in one-on-one pass pro drills or against hand shields or wall pads. Ideal for off-season and winter conditioning! Velcro wrist bands and waist belt make it easy to put on and take off, maximizing time efficiency during practice. Available with resistance bands calibrated at 45 lbs. Bands are made from latex rubber cords with a protective polypropylene cover. "The coaching point is to develop a quick and explosive punch!"